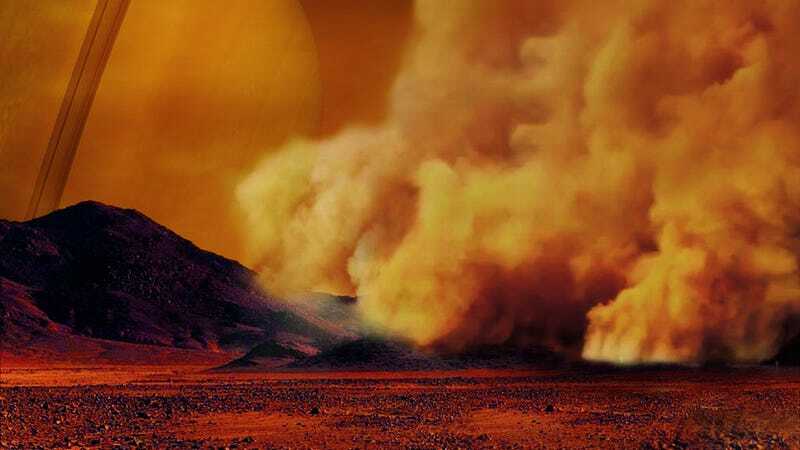 Artist’s conception of a dust storm on Titan. The discovery of enigmatic dust storms on Titan means the Solar System’s most exotic moon just took it up a notch. If I could visit any celestial body in the Solar System, it would have to be Titan. This large moon features an active geology and dynamic atmospheric processes that would truly be something to behold. Measuring nearly 3,200 miles (5,100 km) in diameter, Titan is the Solar System’s second largest moon and Saturn’s largest natural satellite. It’s also the only moon that holds an atmosphere of any substance—a thick haze consisting primarily of nitrogen. Titan is also the only celestial body other than Earth capable of maintaining stable liquid at the surface. But this moon’s many lakes and rivers aren’t filled with water—they’re filled with a noxious, oil-like brew consisting of methane, ethane, and other other liquid hydrocarbons. These seas of liquified natural gas have been observed to form waves and produce enigmatic “magic islands” that occasionally appear above the surface and then mysteriously disappear. If that’s not enough, Titan features a unique weather cycle in which hydrocarbon molecules evaporate, condense into clouds (a process called convection), and then precipitate back onto the surface. So yes, it literally rains oil on Titan, and sometimes it snows, in the form of benzene. New research published this week in Nature Geoscience reveals yet another astounding Titanian feature: equatorial dust storms. That makes Titan only one of three celestial bodies in the Solar System to produce dust storms, with Earth and Mars being the other two. An animation showing clear bright spots appearing close to the equator that scientists have interpreted as dust storms. The finding was made possible by the late, great Cassini space probe, which used its infrared camera to detect unusual equatorial brightenings in 2009 and again in 2010. The brightenings ranged in size from 69,500 square miles (180,000 square kilometers) through to a whopping 162,000 square miles (420,000 square kilometers), an area larger than all of Germany, and on a celestial body 2.5 times smaller than Earth. At first, astronomers figured the splotches, which appeared during Titan’s northern spring equinox, were just clouds of methane, but further investigations revealed something far more interesting. 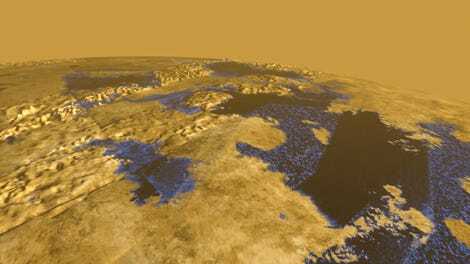 At the same time, the equatorial brightenings were unlikely to be surface features, such as frozen methane or icy lavas (yes, you read that right—Titan features ice volcanoes). If that were the case, these surface spots would’ve exhibited a different chemical signature and remain visible for much longer than what was observed by Cassini; the features were transient, lasting from 11 hours to five weeks. Some examples of the brightening events detected by Cassini. Using computer models, Rodriguez and his colleagues concluded that the features were atmospheric in nature, occurring very close to the surface, and likely consisting of a thick layer of tiny solid organic particles (on Titan, organic dust molecules form from the interaction of sunlight with methane, and they grow big enough to fall back toward the surface). 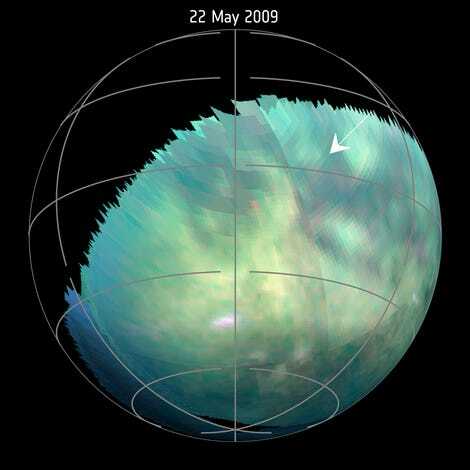 What’s more, the bright splotches just happened to occur over Titan’s equatorial dune fields, strongly indicating that the spots were clouds of dust blown off the dunes. Interestingly, the European Space Agency’s Huygens Probe, which landed on Titan’s surface in 2005, kicked up some organic dust during its landing due to its powerful aerodynamic wake, according to Rodriguez. In terms of next steps, the researchers would like to know if these strong winds are kicking up sand, in addition to the organic particles. If that’s the case, Titan features a complex global cycle similar to what’s observed on Earth and Mars. Titan is a true paradox—a celestial body with obvious comparisons to our planet, yet so profoundly alien at the same time.